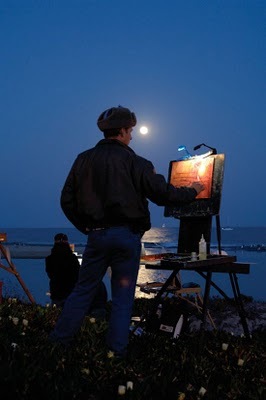 A few years back I was contacted by Allison Malafonte of American Artist Workshops Magazine, asking me to organize a Moonlight painting workshop in Santa Barbara... in two weeks! With the help of some friends whom I had taught plein air nocturne painting to (in the past), I was able to pull it together and teach the workshop. When the workshop rolled around, we lucked out. The weather was perfect, the moon rose right on time. Bill Dewey showed up to take shots for the Magazine. I'm showing this photo because of the, "SUPER MOON", that is appearing around the Earth both yesterday and today. I was hoping to get out and capture it in paint, but alas, here in California, where it never rains, it's pouring. The forecast calls for rain all week...So any thoughts or dreams of super moons I will have to paint from my imagination. It's times like this when I will rely on the wisdom of Albert Einstein. He said, "The Imagination is Everything".